A Wrinkle In Time : Why I wasn't feeling 'it'. I remember watching it and feeling like.. come on 'surprise me' or 'hit me with something' the whole story's lost somewhere between inspirational and fantasy. 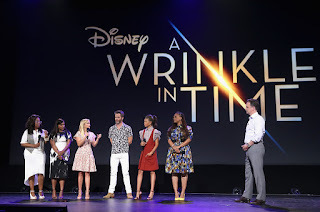 A wrinkle in time is meant to be a great movie, but turns out to be a not that great movie due to imbalance of character, the whole thing is bland and uncoordinated, characters were out of place, I don't even want to touch "Charles Wallace". So these two kids, and a third who I didn't even know why he had to tag along, it's not like meg needed any protection or what ever, she seemed pretty strong headed and efficient. I'm not saying the whole thing is not worth it, just a few major errors here and there. Meg, Calvin and "Charles wallace" embark on an astronomical journey through space and time to find her missing father. Hearing this alone should promise more, but the movie got derailed from the start I mean the whole thing is because he left for four years? That seemed pretty short, couldn't it have been fourteen? Or twenty four?, no wonder the grief didn't feel real, they should have learnt a thing or two from interstellar. Our protagonist Meg though, wasn't really out of place she seemed too real for the movie, like it could not contain her, Oprah was just, well, Oprah. So they get to this beautiful planet whose name I cannot remember, which Reese announces to be her best planet in the universe, She played among the three guardians as.. . She got her part very well I must say, I honestly began to watch her at some part in the movie and lost interest in Meg. Reese for certain reasons did not believe in Meg and asked why she came along the whole thing is about self discovery and she proving herself, well it's a Kid's movie anyway. Calvin our hero, did great, chivalry lives on though he just appeared out of nowhere and almost became the center of the movie, I had to slow down a bit to catch up, (maybe he tessered from hollywood to the movie, who knows?). The visuals were stunning, I must give them credit for that, from the dresses to the talking flowers, to Reese's Wardrobe upgrade, wonderful, almost made up for the lacking plot, Meg and Oprah's connection shadowed the movie, it was expected but a bit too much, I mean she's on a quest to find her dad not to show the efficiency of Oprah's inspirational talks (and I must add, the beard meg's dad, played by Chris Pine was just too loud). Their final bonding when they met at last was really moving, though it seemed to portray that it had more to do with her little brother. Towards the end of the movie we're revealed of this Great evil who takes control of "Charles wallace" known as the 'it' (I don't know why this disturbingly reminds me of Stephen king) this bad evil really didn't live up to the hype. It's powers when described by Oprah seemed similar to Ares's ways as the God of war in wonder woman. The 'it' offers to transform Meg from nerd to awesome tempting her with a seemingly better looking version of herself but it's overall essence was buried somewhere between the 'goody-purey-beautiful' nature of the film and "Charles Wallace's" Snarky accent, apart from the red streaks on his face, the 'it' just did not deliver. Honestly without the 'it' I think "Charles Wallace" made a better villain. The movie's Cinematography was brilliant, but the characters.. not so, if you like great visuals and fluffy bursts of light, this one's for you. The movie has a similarity to interstellar in plot and context only the protagonist is much older and is more sci-fi than fantasy.